Google Analytics definitions that business owners need to know for higher rankings! Before you dive deep into the diverse reporting data within Google Analytics, you need to understand its vocabulary. Do you recognise these Google Analytics definitions? Sessions, bounce rate, impressions and hits. What about the difference between CTR and CPC? It’s enough to make your head spin. Many more, mathematically-minded business owners, have switched off without really getting to know the platform. Just because it’s a free tool, installed by millions across the UK, doesn’t mean it’s used by them all. 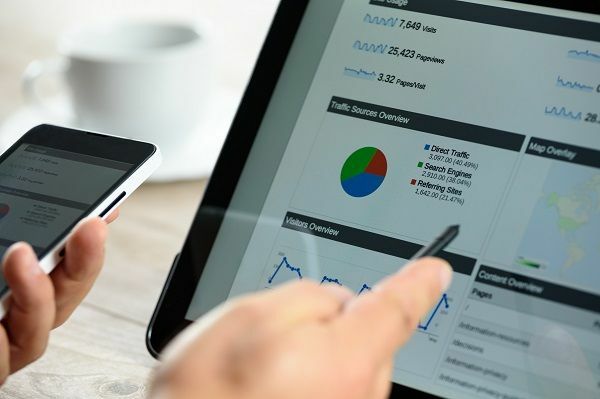 Over the years, we have refined our digital marketing reporting around the evolving capabilities of Google Analytics. We have based today’s article on our experience using the platform to communicate with clients. By the end of this article, you will know how to report on traffic, visitor behaviour and overall conversions. 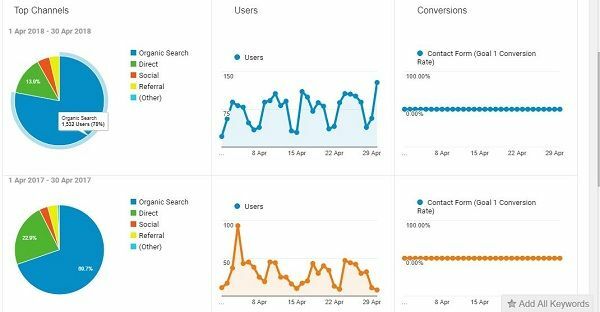 Use these Google Analytics definitions to find the best traffic sources and generate more sales than you can handle. Ready? Yes. Great, now let’s get started. Bounce Rate: The percentage of users who visit a page on your website and leave without exploring your content or clicking further into your pages. Click Through Rate (CTR): The ratio of people who click through to a specific page on your site versus the number of times it’s been viewed. Conversions: The process of someone following the desired action concerning your marketing efforts, i.e. an email sign-up form, website audit, or on-site purchase. Direct Traffic: This traffic enters your site by typing an exact URL into the search bar or finding your site through a saved bookmark. While this may not be a direct influence of SEO work, it does highlight strong brand awareness. People know of your site and search for you directly over competitors. Referral Traffic: These are the visitors who find your website from a referral link on a third-party domain. The most common form of referral traffic is social media posting, link building, citations and guest posting. Referral traffic helps to maintain a steady stream of traffic to your site outside of organic traffic sources. Sessions: The time a user is engaged with your website, app or alternative device. Impressions:How many times a query (keyword) related to your business appears in the search results. Basically, this is the number of times a user comes across your business in the search engines results. Organic Traffic: These are the listings that appear in the search engine results, which are shown based on relevance, authority and valid search engine optimisation (SEO) efforts. If you are looking to be found first by prospective customers, this is the metric you need to monitor. Paid Traffic: Paid traffic comes in many forms. Basically, when you pay for visitors, this is considered paid traffic. These results appear above the organic search results. It’s a quick way of getting your site to the top of Google for high-converting keywords. How many visitors have I converted into customers? The Audience reports section on Google Analytics gives you a snapshot of your audience/s. It will not only tell you how many visitors come to your site, but where they come from, their interests, and if they are new or returning visitors. This will give you a complete overview of your audiences and allow you to compare their behaviour based on specific metrics. Geo gives you a detailed report on where your customers are coming from. You can drill down not only into the country but the city and state. This is especially useful if you have a local business or if you’re trying to rank for multiple locations. Your website is unlikely to benefit from traffic from India if you’re based in Leeds. So, on the face of it, your site may appear to have 300 visitors. Look closer, and you find a good 30% of them come from other locations and 10% of them are from competitors. It’s information like this that can be the difference between a good SEO campaign, and a great one. Behaviour breaks down your audience into new and returning visitors, session duration and on-site actions. This helps you compare the correlation between the time on site and the number of pages visited. Technology reports are vital, especially in a world of mobile-first indexing. They show you which devices are used to find your website – mobile, tablet or desktop. From there, you can optimise your site for all devices to ensure you deliver a flawless user experience. You can also see which browsers are used to bring traffic to your site – chrome, safari, firefox or internet explorer. If you find that your site is mainly accessed through older browsers, then make sure it operates without a hitch. The Acquisition report is essential for getting to know more about the customer journey and experience. Do they enter through an organic search? Alternatively, are you getting most traffic through a paid social media campaign? This way you can see which marketing strategy is bringing in the most traffic. E-commerce sites can also check to see the percentage change of revenue coming in through these different traffic sources. This data is broken down into conversions, average order value and revenue. Your results can be compared monthly or yearly to identify trends and the progression of your campaigns. If your traffic has dipped one month, it may be a seasonal change. For example, as a Gardener, you are going to get more enquiries in the summer months and less in winter – it makes sense, right? If you put money aside for paid advertising, the chances are you will see a significant uplift. These are just some of the things to consider when reporting with Google Analytics. Don’t panic; instead, do some digging. There’s always an explanation behind shifts in data. If your objective is to increase sales for your business, Conversion reporting is essential to ensure you keep on top of profit and loss. This will also help you access what marketing channels are delivering a return on investment. Measure your ROI based on social media campaigns or content marketing, for example. You can identify which blogs or pages have assisted a conversion. From there, your marketing strategy is going to be focused on making more of the same powerful content. Why not try our free website audit? Contact us for Google Analytics definitions & more! Hungry for more? Now you understand Google Analytics definitions, it’s time to get started on reporting. At Bigfoot Digital, we specialise in SEO campaigns proven to generate position one rankings for companies across the UK. We include full Google Analytics reporting alongside our campaigns for complete transparency. We pride ourselves on honest reporting. If we know something, you will too. Our reports are bespoke to your business meaning we focus on reporting that monitors your KPIs. If you are looking for an honest, reliable SEO agency to manage your marketing, you are in the right place. We take special care to ensure you are in the loop with everything regarding your campaign. From Google Analytics definitions to results-focused strategies, we deliver a complete service. Give us a call on 01226 720 755 to find out more. Alternatively, you can send an email to enquiries@bigfootdigital.co.uk – we can’t wait to hear from you.